I actually had some time to do some nail art! Yay! 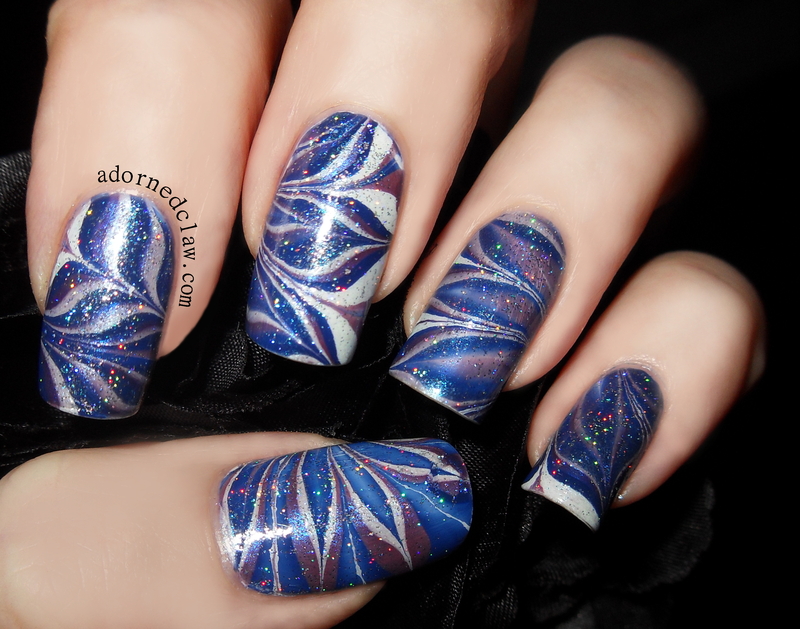 😀 So here is a very sparkly water marble! I created the petal pattern by dragging the polish out from the center with a tooth pick, and then back from the outside to the center between the petals. After I dipped my nails, waited a bit for them to dry and cleaned round my cuticles I added a coat of Sparkling silver then I finished it off with my top coat! 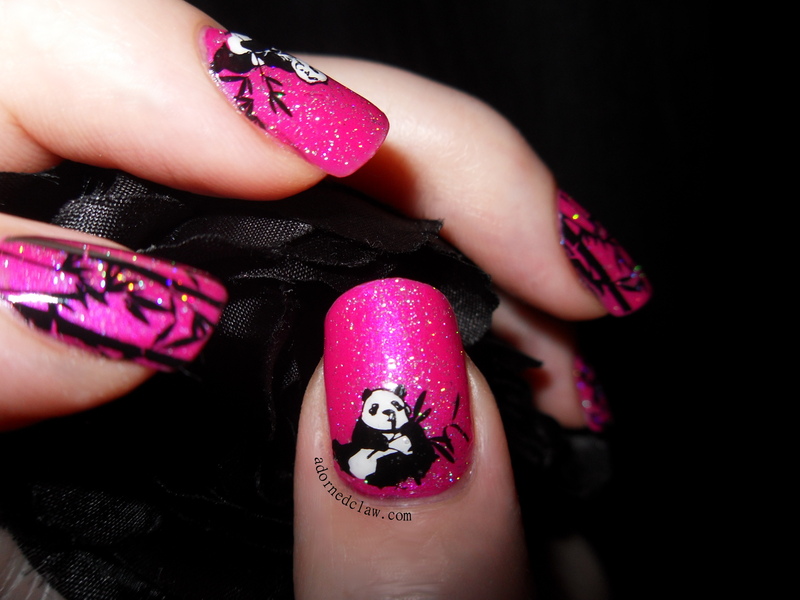 Pink Panda! Stamped Decal Nail Art. 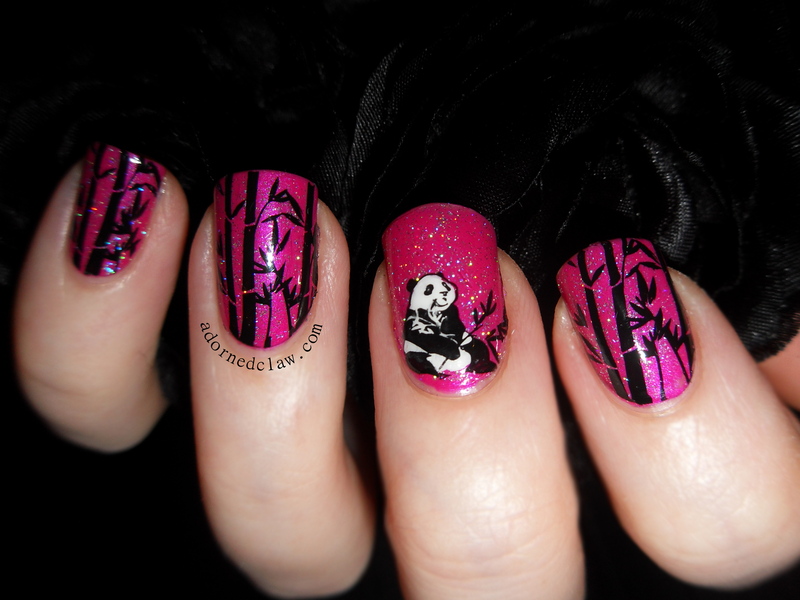 I started by making the Pandas using the Stamping Decal technique, using Bundle Monster Plate BM-424. 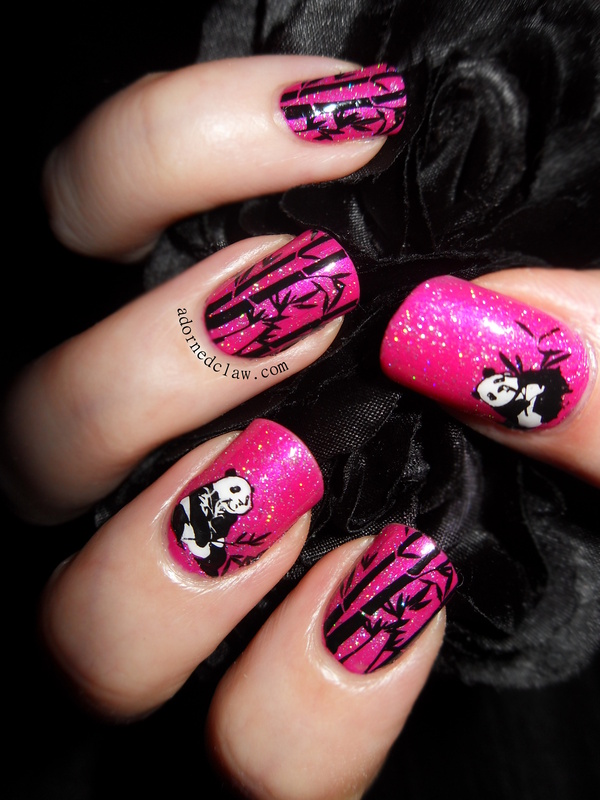 Using Konad special polish black and Sally Hansen-Ivory Skull along with my Color Club topcoat. While they where drying I applied two coats of Essie-Tour De Finance, followed by one very thin coat of No7- Sparkling Silver, I only have a tiny bit left and this polish was discontinued years ago (cries) but I have found the closest Polish like it, Fairy Dust from China Glaze! The Bamboo image was also on Bundle Monster Plate BM-424 and again I used Konad SP in black. I finished them all of with another coat of Color Club topcoat. Amazingly it covered up all the little crinkles and fingerprints from my poking and squishing! 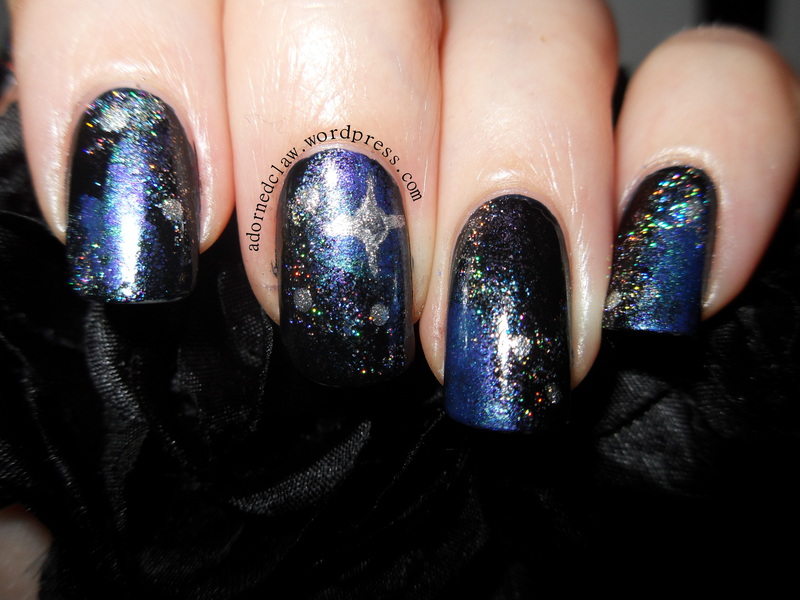 I used loads of nail polishes for this, I started with a base of Vamp Polish From Eyeko, then using a tiny bit of sponge I added a little bit of Blackened Bleu from Barielle shades and Alias from color club. 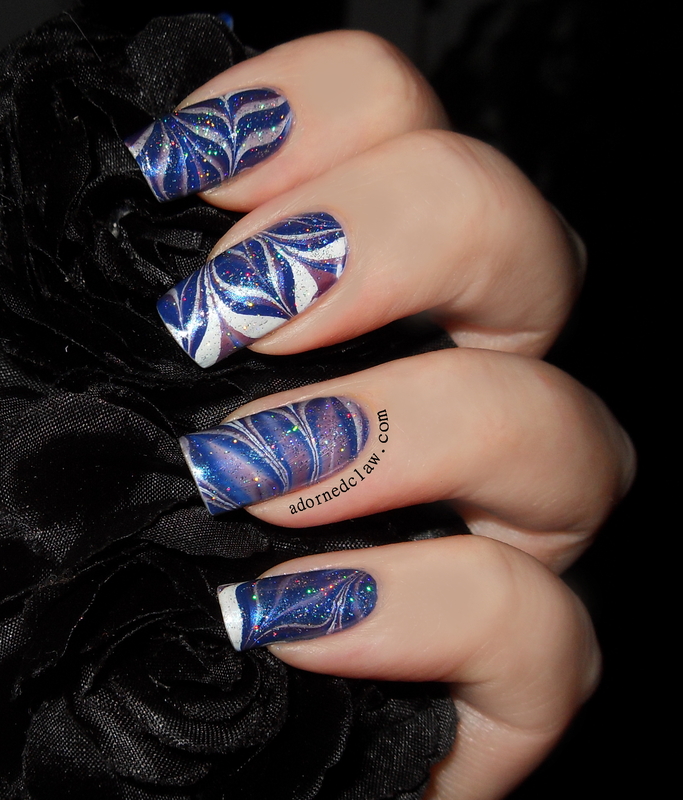 Blackened Bleu is a lovely black jelly with dark blue and turquoise glitter, Alias is a dark blue jelly with purple duo-chrome glitter, it’s really pretty! At this point it looked like a patchy gradient, after it had dried I added Gorgeous from sinfulcolors this polish is a bright turquoise metallic with a light gold sheen and secret agent from color club which is a light purple metallic polish. I put a drop of each polish next to each other onto an old plate and picked up both colours with my trusty bit of makeup sponge, and added a tiny bit to each nail. I finished it with a coat of fast dry topcoat from color club.